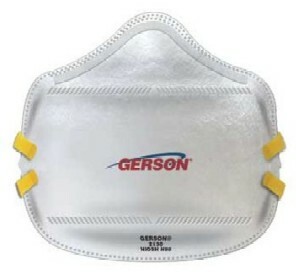 PRODUCT: Gerson #2130W "Smart Mask", Foldable N95 Particulate Respirator. Each Mask Individually Sanitary Bagged/Sealed. 20 Masks/Box. Price/Box. Medical: Approved to help prevent against Avian Flu, SARS, Smallpox and Tuberculosis. Meets CDC Guidelines for TB Exposure Control. Passes the stringent 160mm HG Fluid Resistance Test. Limits: not for oil particles; will not protect against hazardous gases or fumes; suitable for short-term use not extended wear.